The 2015/2016 team has 50 members – about 25 new members and 25 returning members. This year we are aiming to finish top 40 this year – a 14 place increase from where we finished last year at Formula SAE Michigan. We are attending 2 competitions this year!!! We are going international to compete at Formula North, a competition of half American teams and half Canadian teams! It’s the first time in over 5 years that we go to 2 competitions. We are aiming to implement new features such as carbon fiber suspension A-arms, a data-acquisition system, and a custom carbon fiber steering wheel. We are doing advanced research: an aerodynamic package, custom carbon fiber wheels, a chassis dynamometer, a semi-automatic shifting system, and a single-cylinder engine that the team may want to eventually implement in the near future. This year, we are developing partnerships with the Metro-SAE teams such as Rutgers, Columbia, and Stevens. We are currently doing driver tryouts at Rutgers University. 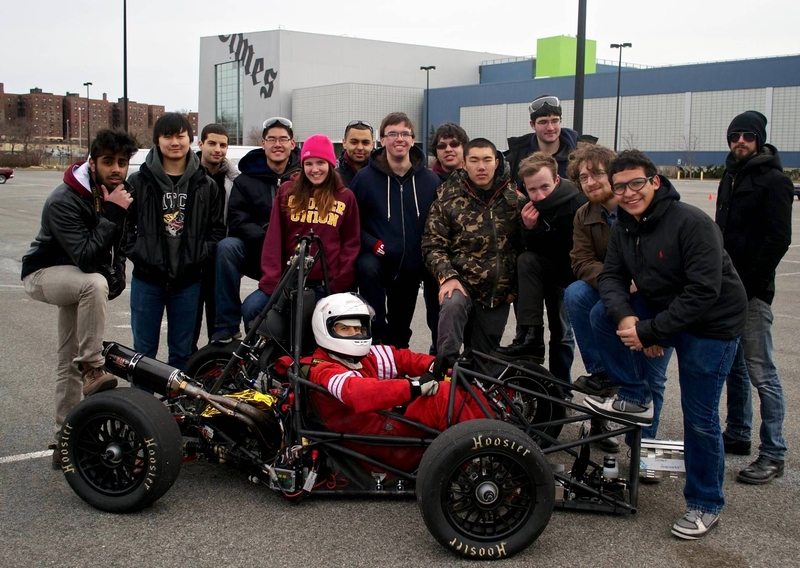 The Columbia and Cooper’s FSAE teams are planning to test together at Rutgers this weekend. We look forward to some healthy competition with them as the season progresses, especially in the spring when we will all test our 2016 competition vehicles. We are also planning to do an outreach event at Northport High School out in Long Island. We will demonstrate the racecar at Northport and talk to the students about studying engineering in college, what it means to study engineering, and answer any college related questions they may have for us. We are looking forward to this event. We believe that it will be helpful to the students to hear about the experience of studying in a STEM field directly from college students. The CU Motorsports team needs to raise money for building and testing the FSAE car and to fund attending the two competitions that it participates in. For information about becoming a sponsor, please see the Cooper Motorsports website. This entry was tagged Amy Chambers, Bobby Walsh, CU Motorsports, FSAE, Hunter McKane, Sergio Rodriguez. Bookmark the permalink.